Crest Or Slump | Mediterra - Swim & Run Better Than Ever! I imagine that most who are drawn to Total Immersion are fairly motivated people. We see inspiring common threads in the kind of people who attend our training events. But I am sure even greatly motivated people struggle to keep the momentum of training or exercise from time to time. Even I do… occasionally. I’ve been training in swimming (and other individual sports) for 25 years or so. And there is one pattern I have learned to recognize and respect- I can make my lifestyle of exercise easy or hard by how I space that activity. 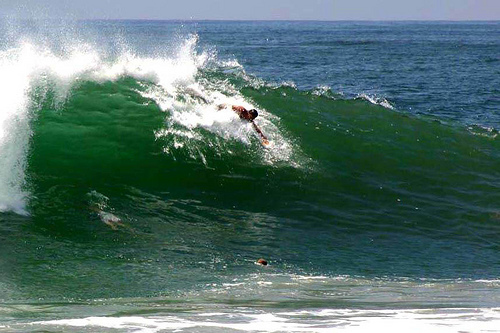 Exercise (or training) uses the momentum of habit like a body surfer uses a wave. But if we wait a bit too long, the crest moves past and then we’re stuck paddling our way forward against a back-current – quite hard work if you’ve ever tried surfing. The simple application is this: even after 25 years if I let more than one day go between some sort of training or intentional exercise movement, I lose mental momentum for the training. But if I keep it up consistently I can enjoy a seemingly effortless habit of exercise. My years of practice have instilled a deep habit of training which won’t be broken easily. Yet, if I skip a couple days I don’t quite feel so eager to get out there. Once I do, I love it and can feel the energy surge up again. It has really never changed over all these years. If I exercise on Day 0, then I feel a lot of momentum to exercise on Day 1, my mind pumping with focus for the next session and body eager to get more energy. If I skip Day 1 (which often is the case because of how I need to divide my time) I still have an eagerness that I can count on and I can still keep momentum. But if I skip Day 2 as well then I often feel The Slump – my mind and body start feeling a pull towards being lazy. I know so well that this is totally false, and all I need is to get out there and the energy will flow again. But I still have to paddle against The Slump just about every time. We cannot overlook the power of that habit also. After a year or so, let alone 25, it becomes more than a habit – this lifestyle of training becomes part of our identity and that makes it an even more powerful habit. As the momentum builds we have more resilience against falling into The Slump. But still The Slump is waiting for us, even just a few days away. If you are in front of the training crest, keep enjoying the ride, but keep in mind that you do need to keep yourself in front of it in order to enjoy the motivational energy it provides. When you find yourself caught in The Slump I encourage you to dig in an paddle your way forward. Get up and out there. DO ANYTHING to get your energy pumping again and you’ll feel the wave start to build up behind you again. I recognize this pattern with my equally long “career” of training. Though, from time to time there are the inevitable illnesses or injuries, after which one needs to muster the mental energy to get started again. After a particularly challenging period of constant injuries I learned to love the challenge, i.e. not just enjoying the ride on the wave (yes, I’ve surfed in my youth!) but winning the battle of getting back there again. This has led me from “Oh, f***, do I have start from zero again? !” to “YES, now I get to show myself what I’m made of!!!”. And this, in turn, has allowed me to go from (on occasion) questioning the meaning of it all to “I’ll never quit”. Quitting is not an option. I totally hear what you are saying and agree. I have had my share of injuries and illness, though thankfully nothing that has completely knocked me down in every physical area. Like you, when injury or illness come that could be seen as an ‘opportunity’ rather than an obstacle. I know Terry is very fond of finding some new challenge to work on when something sets him back in another area. My knee pain prompted me to rebuild my running stride- and it worked. I had lost so much speed over it that I was content then to do the patient slow drills involved in carefully reshaping the form. And illness makes me focus on stretching and developing a few more yoga moves. Leg injuries make me focus on upper body, and vice versa. Coach Terry tells the story of how some health problems last winter essentially knocked him out of any training that required much energy- so instead he spent hours and hours in his Endless Pool perfecting little, but significant features of his kick and catch, without draining his precious little energy. Then this summer, without any distance or speed training like he had done in the past, he set several new best times or finishes in some races- though he was ‘weaker’ than previous years. He did not let the illness hold him back- he found new ways to move forward. For me, over the years I have kept several skill-building interests in my pocket, so to speak, so that when there is an interruption in one, I have another to turn to and keep riding the momentum. So in this way, I have never really had an interruption in my training habit in those 25 years- just changes in the activity. For instance, I decided I wanted to learn some yoga sequences so I would have something I could work on in hotel room, or when I am ill and can’t move too much. I also find myself getting focused in one area and when the season changes (from OW to pool, or run-emphasis back to swimming emphasis, for instance) I need a couple weeks to complete the mental transition. This is not so much of a loss-of-momentum as it is a change of direction. PS- I allegedly have a torn meniscus so now I am learning to adapt to that and hope it heals. I’ve been kept from running for 5 months. So now I do yoga (good posture) sitting and breath-concentration drills to give me something new to work on. I would encourage us all to keep the mental momentum of skill training going strong, even when the body is shut down. In this way I might explain why I have never had a down-season in those 25 years- with shoulder injuries (pre-TI), when I worked like a dog for 70 hours a week and still found a way to get out, when I had no water to swim in and could only run at 5am in pitch darkness because of duties during the day. I always found something else I could do. The ultimate message here is ADAPT. Never quit. Just move that passion for learning to a new thing, until we can (hopefully) resume the other thing again- or learn to the that thing in a new or better way. It’s this feature in the attitude that makes us resilient to injury and aging, and the uncertainty of life.